I'm a lifelong Saints fan, and I'm still feeling heartbroken, but I am truly honored to have lost to a team with such a classy, kind-hearted fan base. NFL Network just ran a story about all the winning playoff teams trolling the losing teams. Vikes fans were the only ones not trolling. Instead, they are sending $$$ to a foundation our punter (Morestead) started (you guys have already raised 100K for his foundation). I have such wonderful memories of the Super Bowl in 2009, and I genuinely hope that you guys get to experience that exhilaration. I'll be pulling for you guys to win the SB. I've spent my life yelling Who Dat. For the next two weeks, I will proudly scream SKOL! nola4ever wrote: I'm a lifelong Saints fan, and I'm still feeling heartbroken, but I am truly honored to have lost to a team with such a classy, kind-hearted fan base. NFL Network just ran a story about all the winning playoff teams trolling the losing teams. Vikes fans were the only ones not trolling. Instead, they are sending $$$ to a foundation our punter (Morestead) started (you guys have already raised 100K for his foundation). I have such wonderful memories of the Super Bowl in 2009, and I genuinely hope that you guys get to experience that exhilaration. I'll be pulling for you guys to win the SB. I've spent my life yelling Who Dat. For the next two weeks, I will proudly scream SKOL! Thanks for posting. We're hoping to experience that as well. It's been far too long. Thanks for a kind hearted post. No time for trolling.......gotta move on to the next game. I told my son the whole game that I felt bad for your punter as he was in obvious pain but what a warrior......peace out. Out of curiosity, what do you think of the pics of Payton mocking the SKOL chant? I mentioned in another thread, if Zimmer did that, I'd want him fired. Are the fans in NO ok with that? PurpleMustReign wrote: Out of curiosity, what do you think of the pics of Payton mocking the SKOL chant? I mentioned in another thread, if Zimmer did that, I'd want him fired. Are the fans in NO ok with that? I personally find it childish. Didn't see it and don't know the circumstances, but some have tried to blame it on antogonizimg fans behind the bench. That excuse may well be a cop out. It's the kind of thing Cam Newton would do and I totally despise him and everything he stands for. Payton is aggressive and in your face. A big reason why players love him. At home games he is often waving his arms to pump our crowd up. IMO he is too much of an X's and O's genius to do some of that stuff. Leave that to the Rah Rah Cheerleader coaches like Mike Tomlin or Jason Garrett. That being said, if it was done to one of our hated rivals like Atlanta, I wouldn't have much issue with it. They often instigate things like playing our rally songs over their PA system only to be interrupted by their Train Horn. Also, anything done in response to Cam Newton's antics is fine with as well, lol. I just don't like being the instigator. Perhaps the fans behind the bench were mocking our Who Dat chant early in the game, but even so you have to expect some of that and be above that as a head coach. IMO Payton's emotions probably got the best of him. If you don't want to deal with the opposing home teams crowd....play better and win home field. Glad to hear you say that. I can't stand Cam Newton either for the exact same reason. From an outside, neutral perspective, I've always seen Sean Payton as something like the Cam Newton of coaches. I would also include Jim Scwartz on that list. Personally I find that kind of low sportsmanship more upsetting and offensive than playing near the line of being dirty. Bounty gate never bothered me. You are a true gentleman in defeat. Thank you for this. That's a heck of an attitude. It would be really easy for you to be bitter. Disappointment is understandable, to say the least. But you had the integrity to come here and congratulate us, and you've taken it an amazing step further by pulling for us. I feel fortunate that we have Payton as our coach, but I thought his behavior was despicable. I had a problem with the throat gesture against ATL too. Coaches should act like that. Lots of people in Nola had a problem with it. He was asked about it in the press conference, and he said he was simply having some playoff fun. As a Saints fan, it still bothered me, though. It's simply not indicative of the spirit of our city. Last year, at the Dome, we were getting pummelled by the Lions, and we started buying a bunch of their fans drinks. We took pics with them and even gave them recommendations for good restaurants. We love the Saints, but we love people more. Thanks, J. Kapp 11. You guys are just as classy. I can't imagine playing the SB in the Dome. It would be a dream come true. I seriously hope you guys pull it off. i'm usually in the minority in situations like this but I love stuff like what payton did. he's passionate. and having fun. guys love playing for coaches like that. i'm not saying it's the only way. zimmer would never do anything like that and I love him too. but he does some things no other coaches would do too. he was probably hearing from fans all game. when he thought he had the game won he had some fun of his own. in this case we got the last laugh and he looks like an idiot. but stuff like that never bothers me. if you're gonna run your mouth as a fan, you gotta expect to get it back if that team wins. now, if payton was whining about fans being mean after he pulled that i'd be upset. but I always like that little gamesmanship in sports. vikeinmontana wrote: i'm usually in the minority in situations like this but I love stuff like what payton did. he's passionate. and having fun. guys love playing for coaches like that. i'm not saying it's the only way. zimmer would never do anything like that and I love him too. but he does some things no other coaches would do too. Here's my problem with it. Sean Payton's actions contributed to his doing bad job of coaching at the end of the game. Don't get me wrong. I am overjoyed at the Minneapolis Miracle. I don't typically buy into stuff like "team of destiny," but even I have to admit that it seems that way for us this year. However, I'm also honest enough to admit that we shouldn't be standing where we are today. Marcus Williams didn't have a clear assignment in his head. He didn't know whether to try and make a pick, blow up the receiver, avoid pass interference, or simply make a tackle in bounds. If he'd had a clue, we probably would have lost. And the sad truth is that Marcus Williams didn't know what to do because he wasn't coached properly in situational football. THAT falls on the head coach. I feel bad for Marcus Williams, not because he messed up, but because his coach LET him mess up with lack of preparation. So while Sean Payton was giving Vikings fans the business, he took his eye off the game, if even for a few seconds. And it cost him. Mike Zimmer is different that Sean Payton, for sure, but the difference goes way beyond personality. It's about details. Zimmer takes care of the details. Sean Payton doesn't, except on offense. He didn't have his team prepared for that situation, while Mike Zimmer did. In fact, Zimmer said the Vikings practice that very situation EVERY WEEK. That's why we won. Zimmer had the Vikings ready for that situation. Payton didn't. Payton assumed the game was over. To me, Payton's actions with the SKOL chant are the ultimate symbol of cruel irony. It proves where his priorities are. For what it's worth, I think he's a crap head coach. People see him as some kind of genius, but I see it differently. Other than one season, he has wasted the career of one of the greatest quarterbacks we'll ever see. I agree with all of that kapp. maybe it did play a part in his coaching. and if it did i'd assume top brass would take a look at the matter. in general, I like some trash talk. I love celebrations after td's. I love the gamesmanship. I love sportsmanship too, and I don't think they are exclusive. i'm betting payton was very complimentary to our players and staff after the game. but I don't disagree with your reasons for not liking it. I don't really dislike celebrations, trash talking (well, that almost always turns into taunting, which I loathe), gamesmanship, etc. It makes the game more fun, especially the celebrations. But think of it this way. If a Vikings player scores a TD, then gets flagged for the celebration -- for example, when Diggs did his nut-hug on the goalpost in Washington -- that's going too far. That's putting antics above the needs of the team. Would you agree? So what I'm saying is that when stuff like that gets in the way of a player or coach doing his job, then it's bad. I think Payton failed to coach up his team by failing to oversee the defense. By failing to prepare for the situation. Why on earth were there only two players for the Saints in the vicinity of Diggs and Wright? That's just horrible schematically. Yes, it's the defensive coordinator's job to set that up, but it's the head coach's overall responsibility. Did Payton's sideline antics get in the way of his oversight of the final 0:25. I wouldn't claim to know that. But it's pretty easy to see that his coaching was lax at the end. To my mind, Sean Payton was as responsible for that loss as Marcus Williams was. Probably more. I agree with just about everything said here. The word in Nola is that the coaches were frantic about a potential pass interference penalty, so they kept warning everyone to do whatever they could do to avoid it. All the interviews I've seen with Marcus suggest that he headed for the receiver, and upon realizing that his timing was off, ducked away at the last minute to avoid a PI call. In the process, he also knocked Lattimore down, and Diggs (after making an acrobatic catch) was able to make the play. Initially, some Saints fans were angry with him, but they neglected to realize that his key INT got us back into the game. In 2009, we seemed to have an unexplainable magic, and I see the same thing happening with the Vikes this year. I agree. It was bad coaching by Payton and a rookie mistake by Williams, but you guys capitalized on it, and you deserve the win. I'm heartbroken over the loss, but I'm excited for you guys. 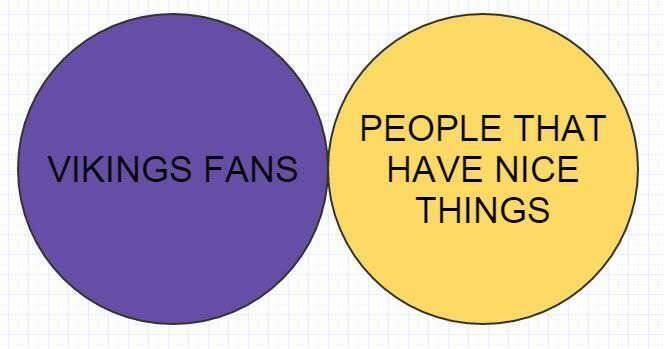 SKOL!